We’ve all been on those campsites where fellow campers come and say hi, and help you pitch your tent on a windy day – well, narrowboat life is the same. Narrowboat owners are super friendly.. it is just the way it is… the pace is slower and people want to stop and chat and hear your story. In fact, owning a liveaboard barge or yacht has long been a dream of mine, but these days you can hire a boat for the weekend and enjoy life on the water. 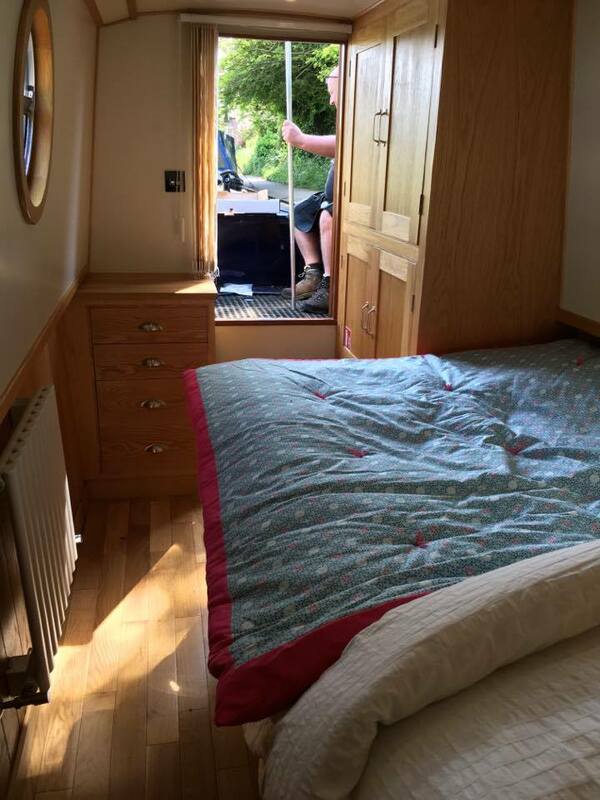 Like camping, it’s still an ‘outdoorsy’ holiday, but these days canal boats are warm and comfortable, and a barge stay, even on a marina, makes for an interesting alternative to sterile hotel rooms for those who love camping in summer, but prefer a warmer place in winter. 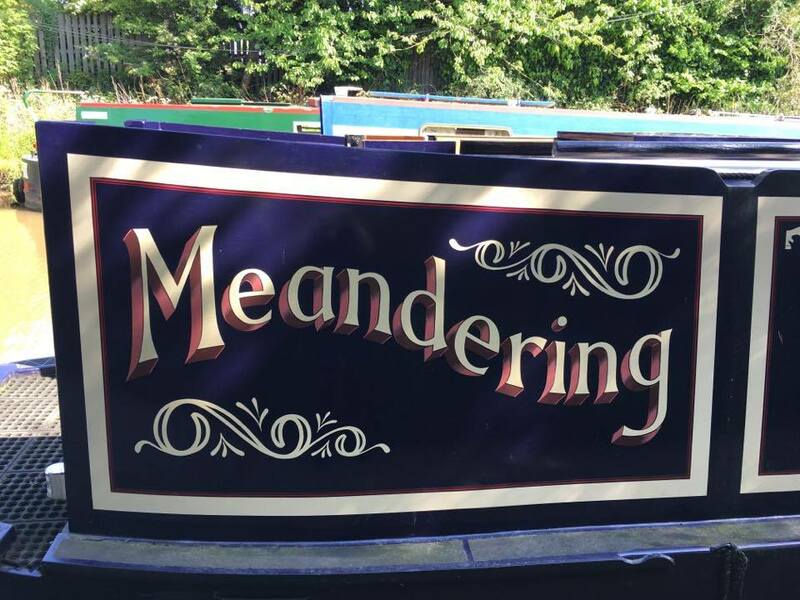 Meandering (shown above and below) is one such alternative that can be easily rented via UKCanalboating.com. 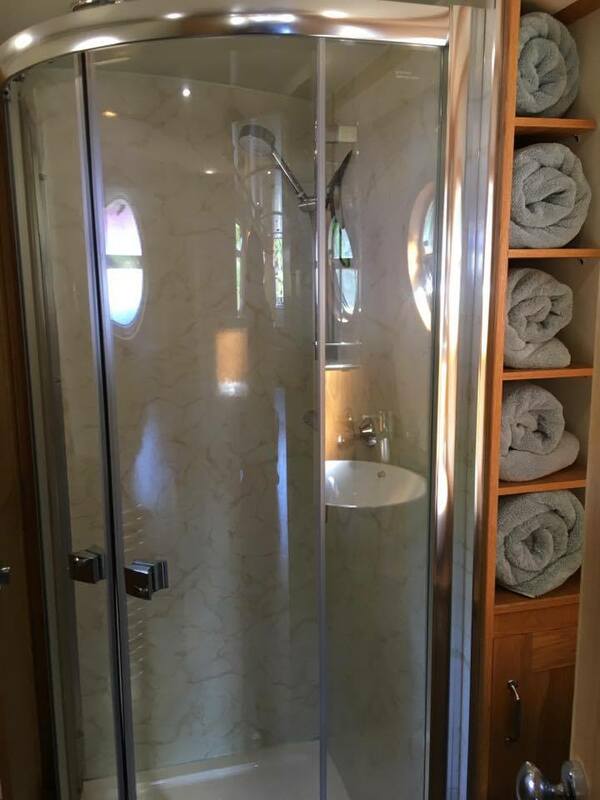 Having only been built in 2013, Meandering features elegant chrome windows and a solid wood interior. 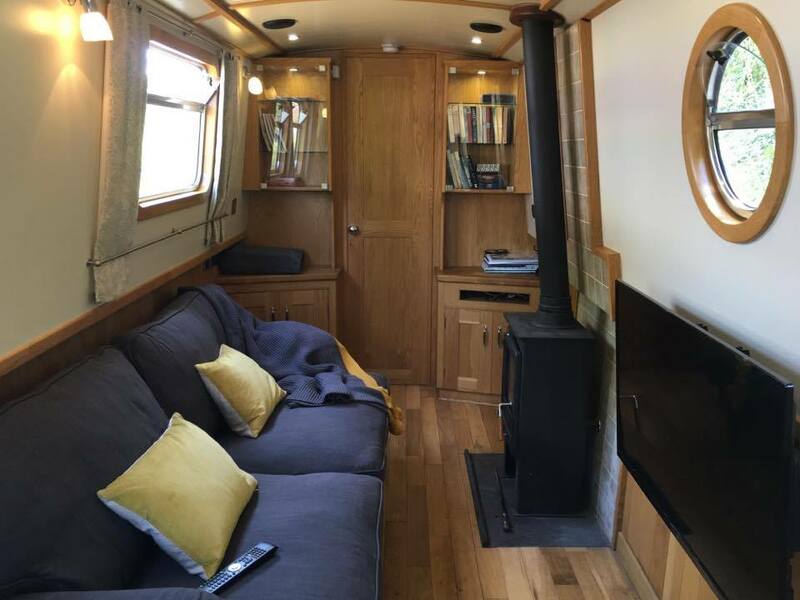 The owners bought her in Cheshire and brought her down to Stratford Upon Avon over the summer on the Shropshire Union Canal. 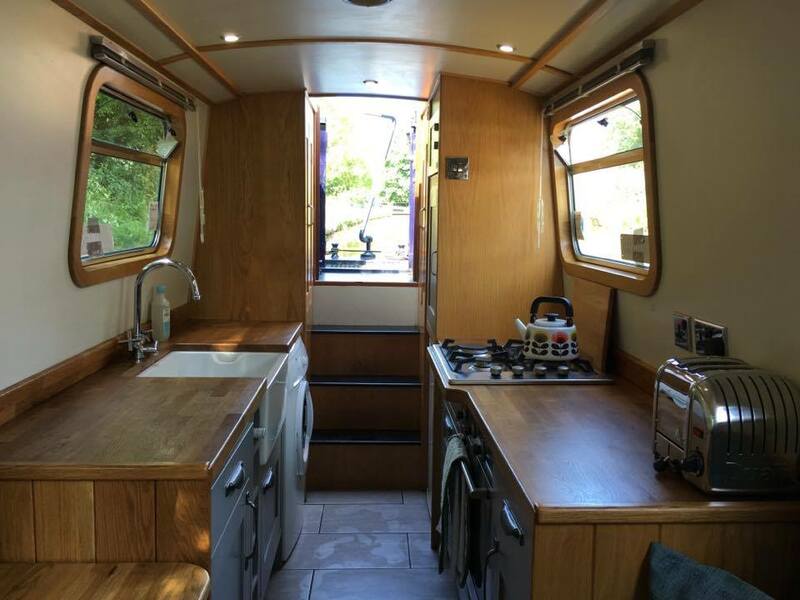 There is a multi fuel burner that feeds the radiators, making her warm and snug in winter, and the boat is equipped with a full kitchen, shower and toilet – and even a washing machine, as well as having a comfortable double bed and TV with built in DVD. 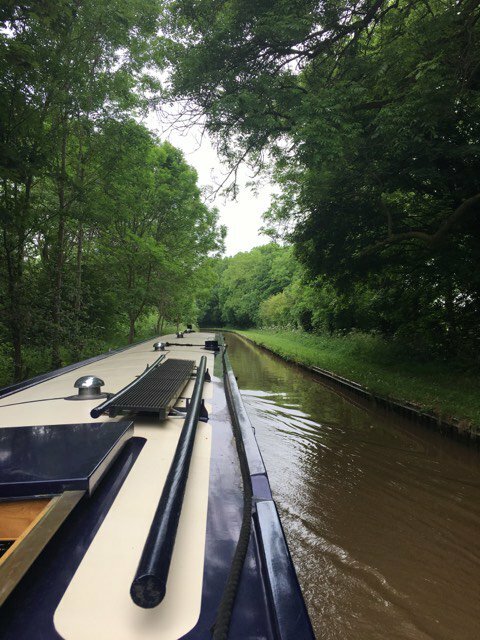 In summer, when the boat is often fully rented, the owners are happy to give a couple of hours tuition on steering, locks and the nearby aqueduct and leave you to it. 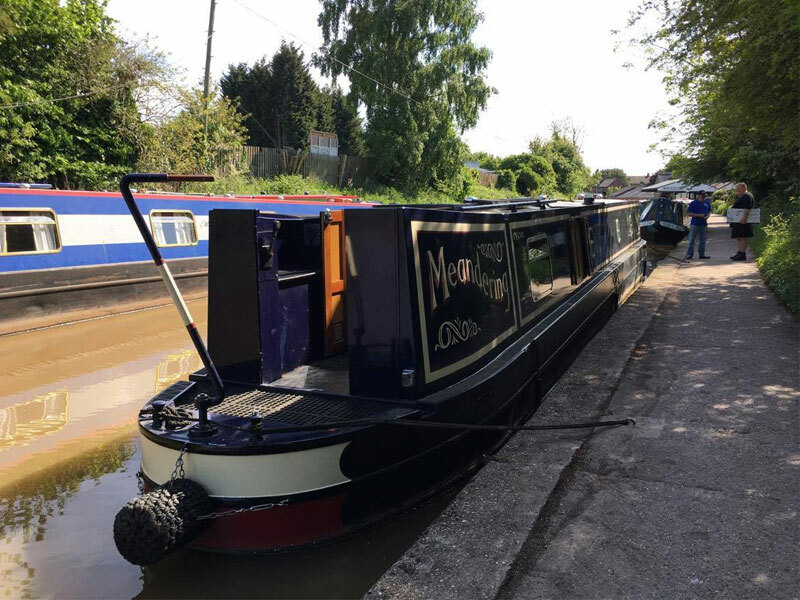 A Winter break sadly will find many of the locks shut, so you will be Marina based – but you’ll still have affordable, quirky accommodation at a very reasonable price in the new Hill Farm Marina with super fast broadband and friendly owners that can’t do enough for you. When the boat isn’t rented, they’ll be on her themselves, so they try to provide those little extras to make your stay more comfortable. The boat is amply stocked with lots of books and films – and the owners (who say that boat life has seen both of them become keen readers!) encourage visitors to take books if they don’t finish reading them while on the boat. The couple also leave essential breakfast supplies and that all-important prosecco in the fridge! Moored in picturesque Henley in Arden, with easy access to Warwick and it’s stunning Castle, the Shakespeare Theatre at pretty river town Stratford-on-Avon, and great upmarketing shopping in Leamington Spa, it’s a perfect location for getting out and about by car, but if just sitting by a warm fire and chilling on the water is your thing, ‘Meandering’ is perfect!